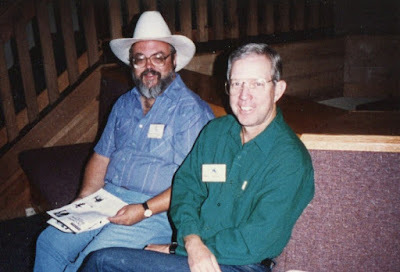 As most if not all of you know, Bill Crider was one of my best friends for many, many years, and Bouchercon is honoring his memory with the Bill Crider Prize for Short Fiction. You can find all the details on this page, but here are some highlights. Lots more info on the Bouchercon page. – One of Bouchercon 50’s goals is to make the largest charitable contribution in the history of the conference. All proceeds from the sale of the books will go toward that effort! LIFT, Literary Instruction For Texas, works to enhance and strengthen communities by teaching adults to read. And Bouchercon gets to help in that mission this year! – For a theme, think no further than the conference slogan: Denim, Diamonds, and Death! – Original stories are vastly preferred. Absolutely no reprints, please. – Stories should be less than five thousand words. Approximately. Sort of. But you know writers. – The book itself will once again be published by the fine folks at Down & Out Books. – The deadline for all stories will be June 1st. If you think you’ve got the story for the anthology, not just a story, please send it to rick@downandoutmagazine.com. We’ll have the book for sale in the book room with some signings and hopefully we’ll be able to make a meaningful contribution to LIFT as well as showcase some of the amazing talent in the Bouchercon writing community. I plan to be in attendance at this Bouchercon, only the second one I've ever been to, and it would be great to meet some of you there. I watched this movie because I’m a fan of Nick Offerman’s droll sense of humor and delivery. He’s one of those guys who’s just funny no matter what he’s saying. And he’s a decent actor on top of it, so I was hoping HEARTS BEAT LOUD would be worth watching, although I’m always a little leery of indie comedy/dramas. They always have the potential to a) not be funny, and b) get too pretentious. 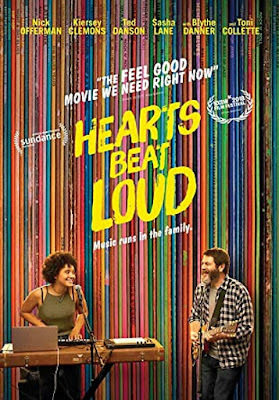 I’m happy to report that HEARTS BEAT LOUD is at least mildly amusing at times, has likable characters, and moves right along with the story. Offerman plays the owner of a vintage record store, a single, widowed dad whose teenage daughter is about to move across the country to go to college. They’re both heavily into music, Offerman having been in a band with his late wife when they were younger, and he doesn’t really want his daughter to leave so he tries to get her to stay and form a band with him. He uploads a song they wrote together and it becomes popular, so he has some leverage to persuade her to abandon her college plans. That’s pretty much the whole plot, since this movie is mostly about the music and the characters, but it’s done well and comes to a satisfactory conclusion. It’s about music, not writing, but the stuff about being creative resonated with me. I thought a few of the scenes went on a little too long, but that’s a minor complaint. 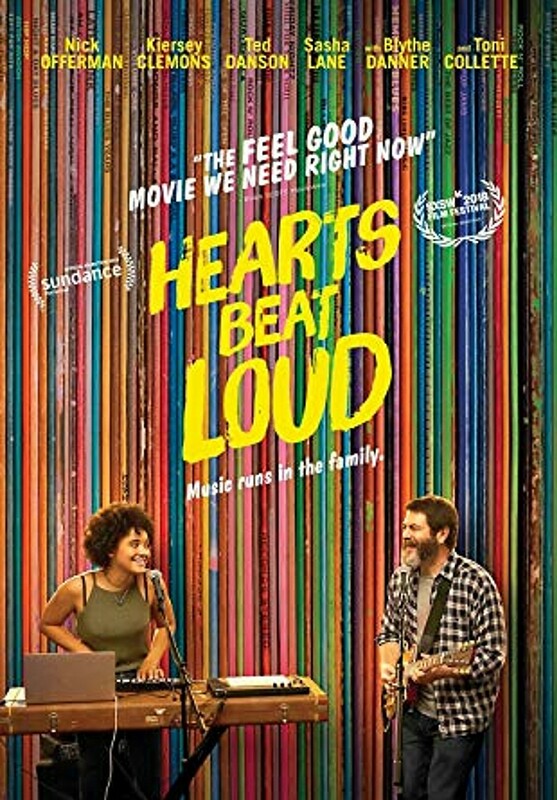 Mostly, HEARTS BEAT LOUD is just a pleasant little film with its heart in the right place. If that’s what you’re looking for, there’s a good chance you’ll enjoy it. 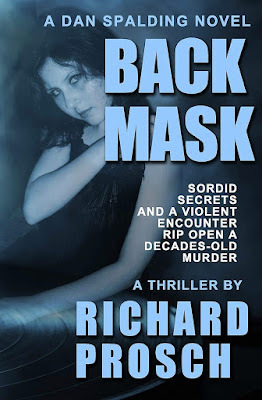 A new mystery novel by Bob Randisi is always good news, and it's even better when it's the first book in what promises to be a fine series. The protagonist and narrator of THE HONKY TONK BIG HOSS BOOGIE is Auggie Velez, a session musician and part-time private eye in Nashville. 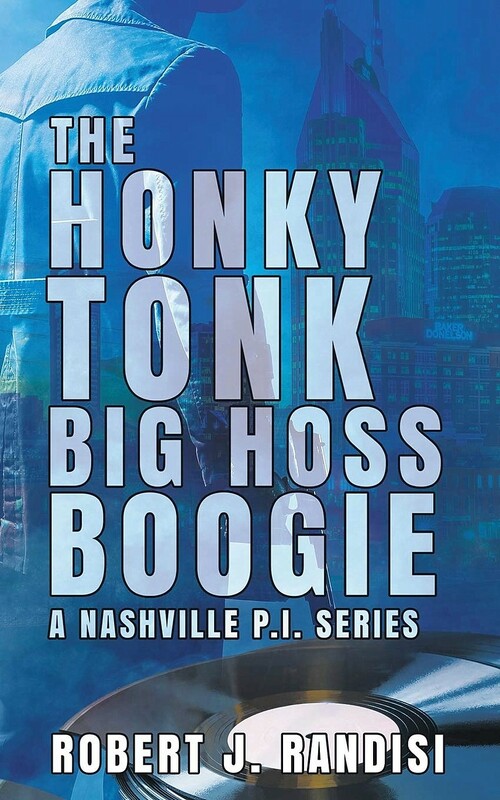 Auggie is hired by a couple of record company executives to deliver a mysterious briefcase to an equally mysterious stranger in a nighttime meeting at the end of a bridge over the Cumberland River. Never trust a guy in a powdered wig, that's my motto. I'm not too sure about the guy in the captain's hat, either, and I'm really curious what the heck is going on here. 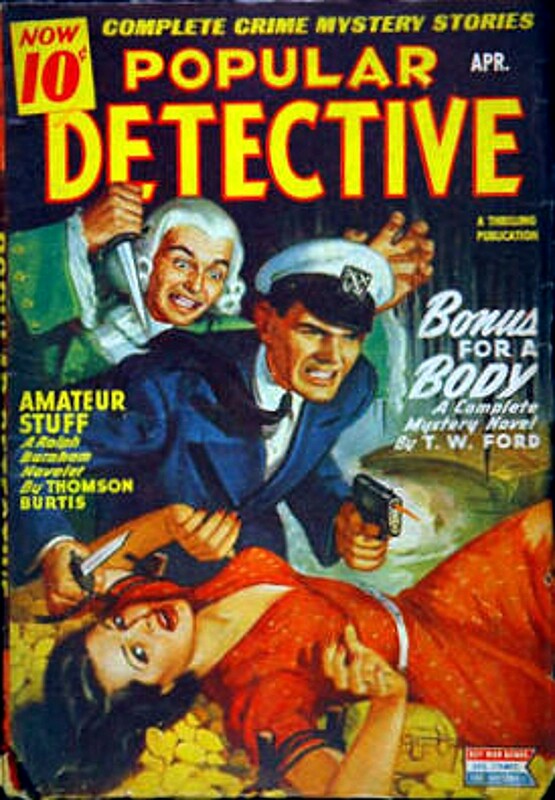 So I guess the cover on this issue of POPULAR DETECTIVE did what it was supposed to. I would've had to pick it up off the newsstand rack and take a gander at the contents . . . where I would have found stories by T.W. 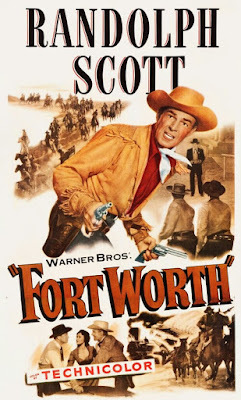 Ford (best known for his Westerns and sports stories), Joe Archibald (one of his Willie Klump series), long-time pulpster Thomson Burtis, and Thrilling Group house-names J.S. Endicott and Frank Johnson. The race is on to span the continent with steel rails—and someone is willing to do anything to stop it, even if it means spilling rivers of innocent blood! 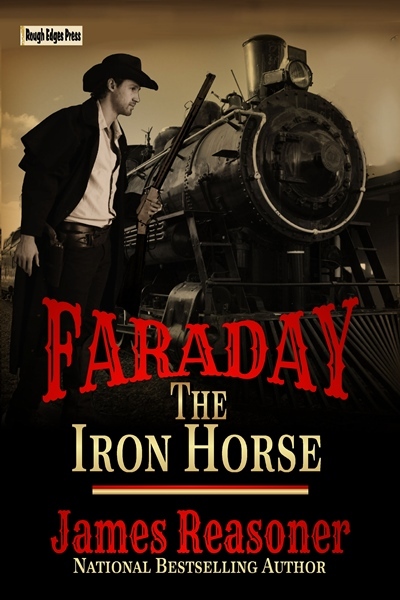 Matthew Faraday is president of the Faraday Security Service, a detective agency specializing in work for the ever-expanding railroad empires. Hired to find out who is stirring up the Sioux and sabotaging the Kansas Pacific line as it builds westward, Faraday sends tough young agent Daniel Britten to the railhead, where he finds himself embroiled with surveyors, track layers, buffalo hunters, and a pair of beautiful young women. But there’s a killer stalking the railhead as well, and not only the fate of the railroad but also Britten’s very life depends on him uncovering the truth. 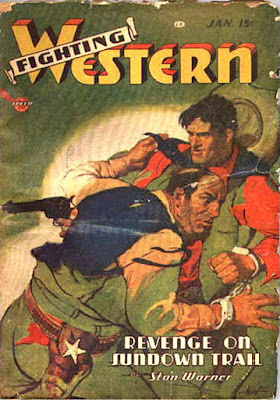 The original version of this epic Western adventure by legendary author James Reasoner has been out of print for decades. Newly revised and expanded, it’s now available again with all the historical sweep and gun-blazing action readers have come to expect from James Reasoner. The cover by Grant Hargis on this issue of WESTERN ACES makes me want to write a story based on it, but I feel that way about a lot of Western pulp covers. The featured story is by J. Edward Leithead, as it usually was during this era of WESTERN ACES, and also as usual, he had a second story in this issue under his Wilson L. Covert pseudonym. Other authors include Wayne D. Overholser, Giff Cheshire, and Glenn Low. 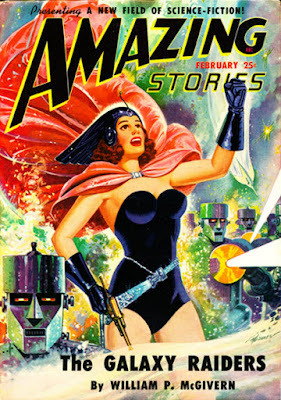 This short novel was published originally in the February 1950 issue of the pulp AMAZING STORIES and reprinted a few years ago as half of one of the Armchair Fiction science fiction doubles. 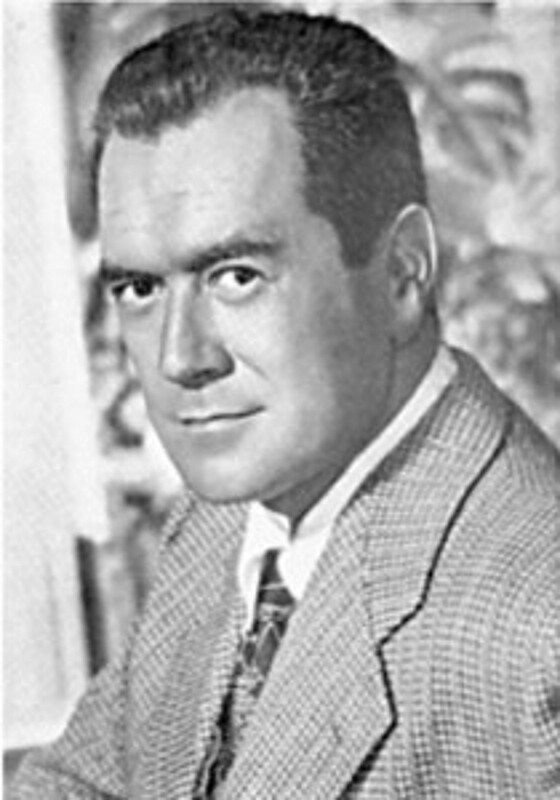 Author William P. McGivern eventually became a very well-regarded author of mystery and suspense novels, with bestselling books and movie adaptations to his credit. 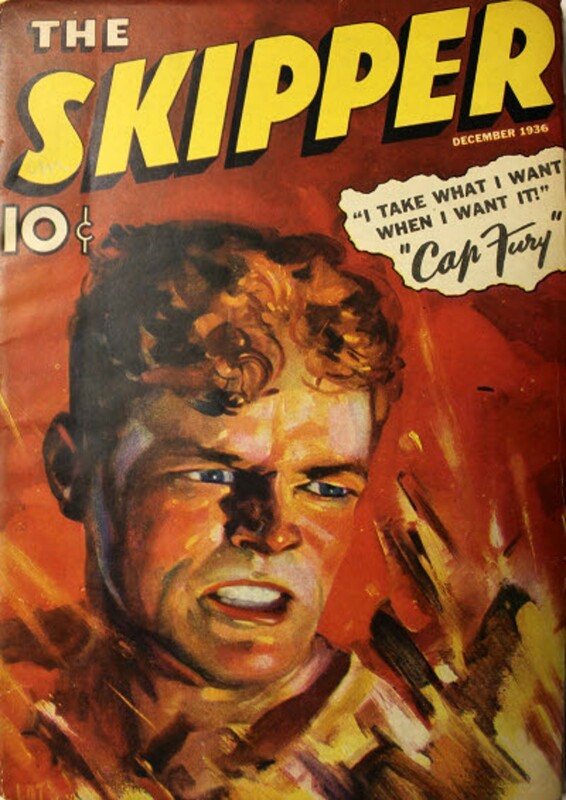 He started out, though, as one of the mainstays of the Ziff-Davis pulp line, contributing many stories to their science fiction and fantasy magazines, AMAZING STORIES and FANTASTIC ADVENTURES. The protagonist of this one is Commander John Storm, a hard-nosed spaceman who was part of a disastrous expedition to Jupiter ten years earlier. Disgraced and drummed out of the service because of his part in that, Storm is brought back because the Earth Federation finds itself facing a dangerous threat that he’s uniquely qualified to deal with. The leaders of the Federation believe that Earth is facing an imminent invasion from the mysterious Galaxy X, and Storm is sent back to Jupiter to establish a base there that will serve as an early warning station and first line of defense. Things don’t go well, of course. Storm has to deal with a beautiful female stowaway, a mutiny, a threat from his past, and, sure enough, an alien invasion. 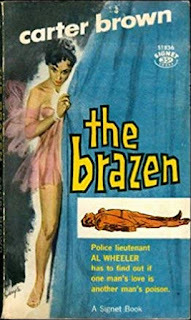 There’s enough plot here for a modern-day SF doorstopper or maybe even a trilogy, but McGivern never lets things slow down long enough for that. It’s action and conflict nearly all the way. The science in this yarn is shaky to non-existent. For example, McGivern never even addresses how come Jupiter has a breathable atmosphere. But 12-year-old boys in 1950 didn’t read stories like this for the science, and neither do old geezers like me in 2019. 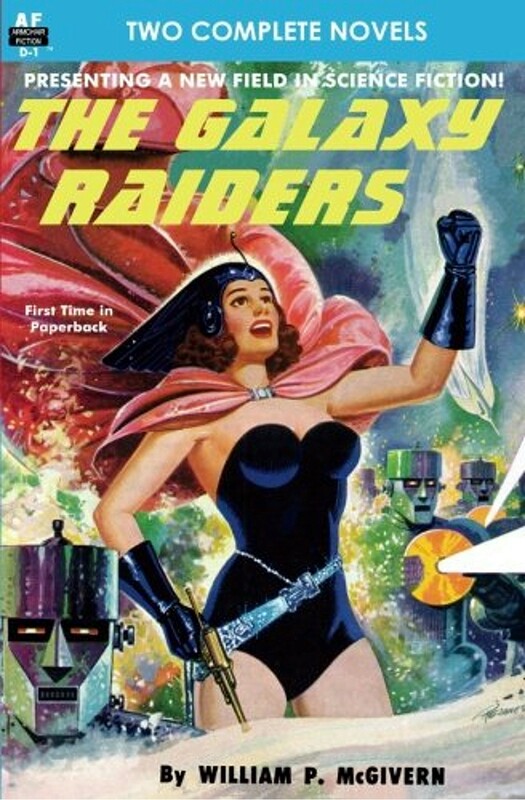 We read them to feel 12 years old again, and in that respect, THE GALAXY RAIDERS succeeds admirably. The cover painting by Robert Gibson Jones does a great job of depicting the Empress of Jupiter and her robot army. 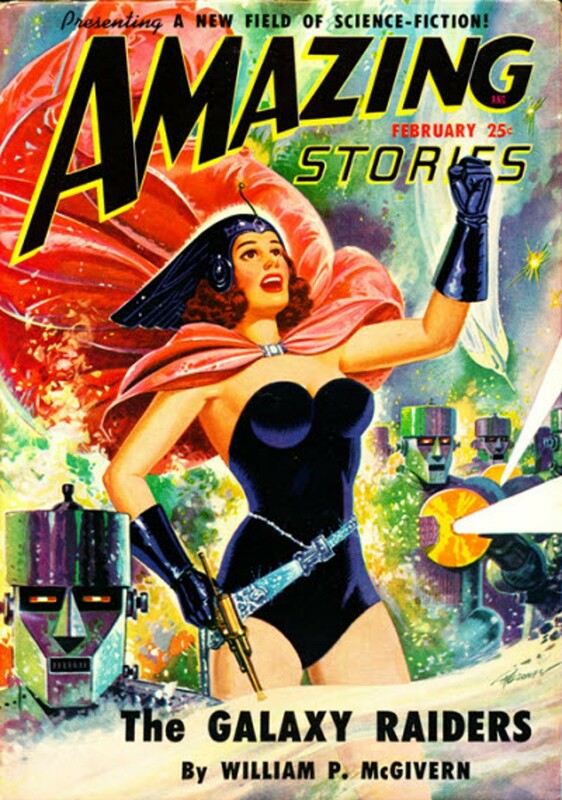 In fact, that phrase right there—“the Empress of Jupiter and her robot army”—ought to go a long way toward telling you whether or not you’d enjoy this story. If you think that’s the silliest, stupidest thing you’ve ever heard, this is probably not the yarn for you, and that's fine. Me, I’ll be over there with my 12-year-old self, sitting on my parents’ front porch and having a great time reading it. I enjoy old time radio programs and have ever since I started listening to syndicated reruns of THE LONE RANGER, THE SHADOW, THE GREEN HORNET and GANGBUSTERS in the early Sixties. There are a lot of shows available on-line, and I wish I had more time to listen to them. I may have to start making some time. The most recent program I've listened to is HERE COMES McBRIDE, which my friend Brian Ritt told me about. 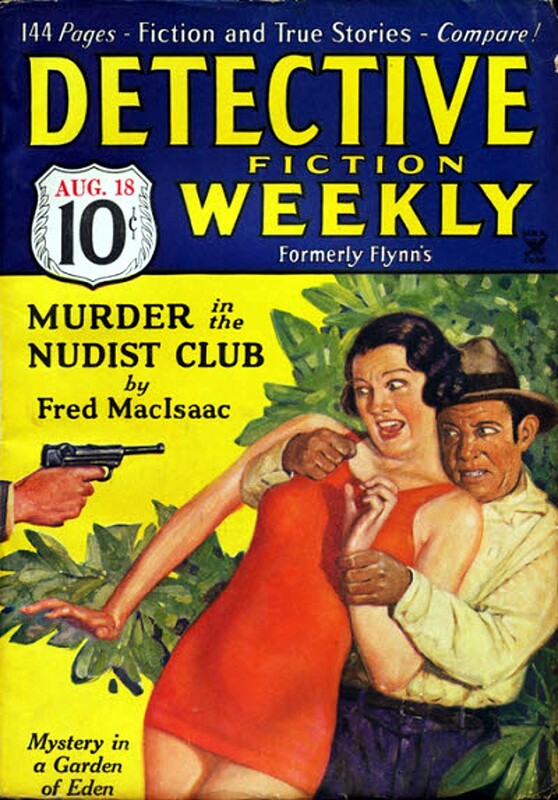 From May of 1949, it stars Frank Lovejoy as private eye Rex McBride, who appeared in pulp stories and novels by Cleve F. Adams. 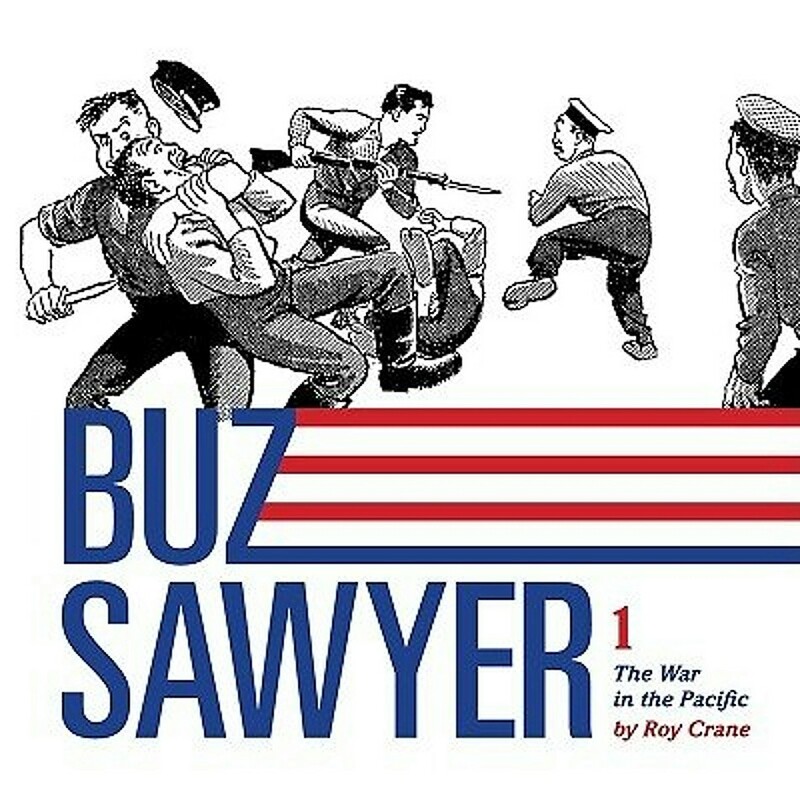 I've read and enjoyed some of them but had no idea there had ever been a radio show based on the character. I don't know how many episodes there were, but only one, the first one, appears to have survived. McBride is actually an insurance investigator based in Los Angeles in the radio version. But as the episode opens, he's in San Francisco on a case, trying to track down a valuable stolen necklace. 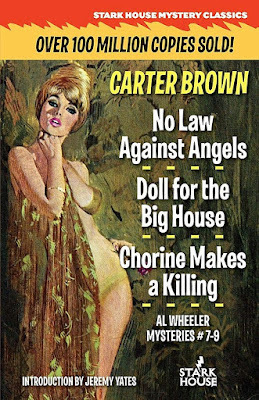 Unfortunately, he finds a corpse in his hotel room and winds up having to solve that murder, and another that follows it, while navigating the usual troubled waters of nightclubs, crooked gamblers, suspicious cops, beautiful but maybe not trustworthy dames, etc. It's standard private eye stuff but done pretty well, and Frank Lovejoy, an actor I've always liked, is good as McBride. If they had ever made any Rex McBride movies, he would have played the character quite well, I think. One nice thing about this program is that Cleve Adams is mentioned in the opening credits "above the title", as it were. I always like to see the guy who created something acknowledged. The episode itself was written by someone named Robert Ryf, who wrote some early cops-and-robbers TV in addition to his radio work. This single episode of HERE COMES McBRIDE is available in several places on-line. I downloaded it here, and you can also just listen to it there if you don't want to download it. 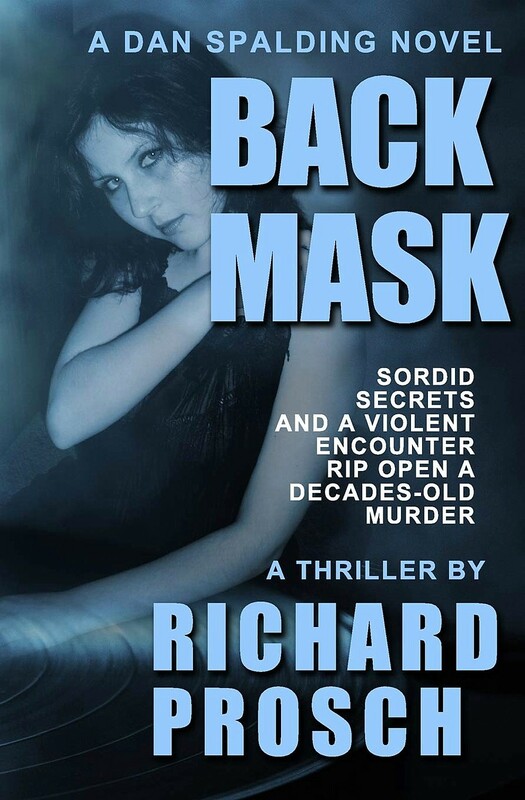 Also, SABOTAGE, the first of Adams' novels about Rex McBride is in print from Altus Press, if you want to check out the original version of the character. It's hard to go wrong with a Norman Saunders cover, but this one is particularly eye-catching, if you know what I mean and I think you do. 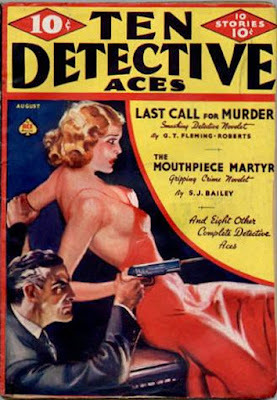 But of course there's more to any pulp than a beautiful blonde on the cover, and in this issue of TEN DETECTIVE ACES are stories by the dependably entertaining G.T. Fleming-Roberts, Joe Archibald, John H. Knox, and Maitland Scott, better known as R.T.M. 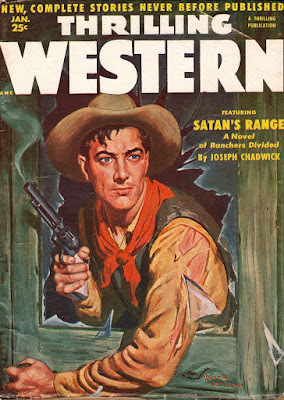 Scott, the author of the first two Spider novels. 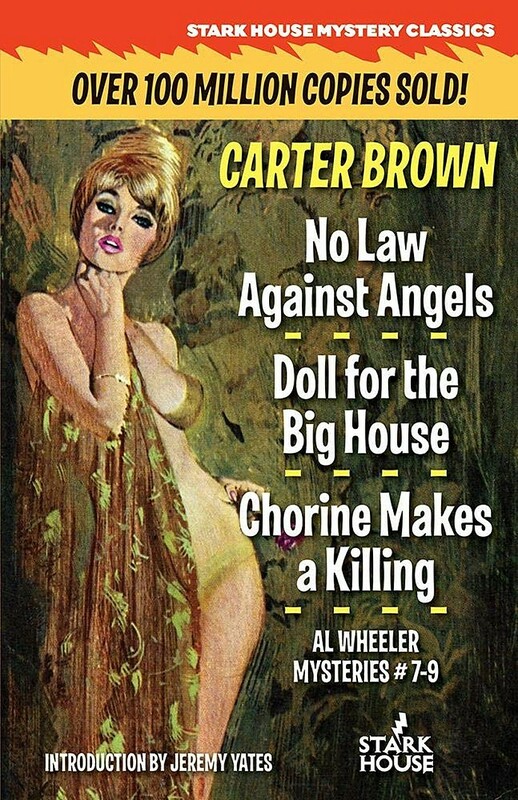 The other authors I've only vaguely heard of. I don't know if the cover alone would have prompted me to buy it if I'd been around in 1937 and had an extra dime in my pocket . . . but I would have had to think about it, at least. 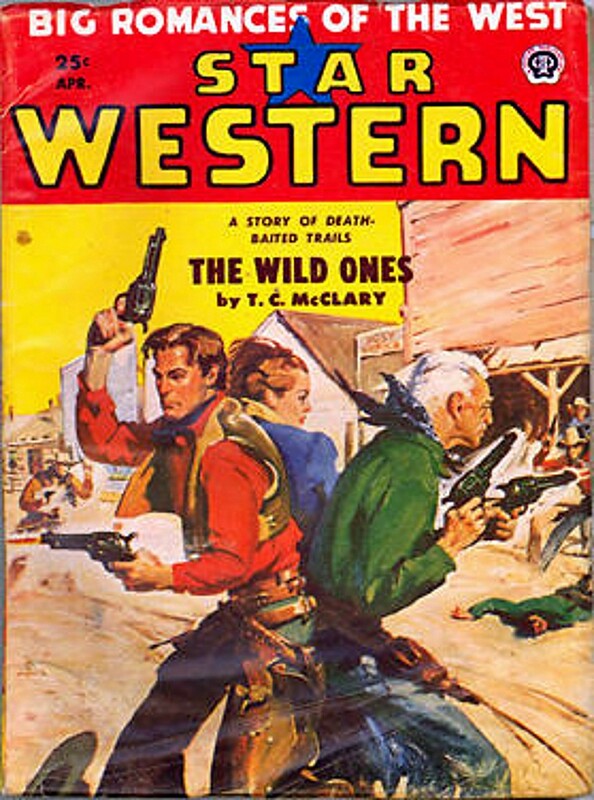 This issue of STAR WESTERN from April 1954 is one of the latest appearances I've seen of that trio who appear on so many Western pulp covers: the stalwart cowboy, the redheaded gal, and the old geezer. 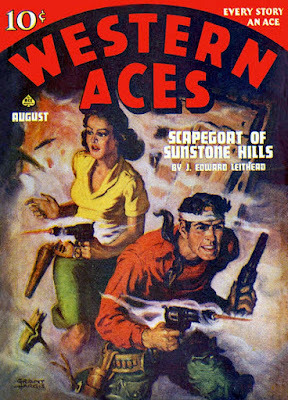 Often the girl is toting a gun and sporting a fierce expression on her face. Not so much this time, but the way the figures are arranged, she could have a gun in her hand and we just can't see it. Anyway, this is far past the glory days for STAR WESTERN, but there are still some pretty good authors in its pages: Joseph Chadwick, Will Cook, William Vance, Paul W. Fairman, T.C. McClary, Richard Ferber, and Robert L. Trimnell. 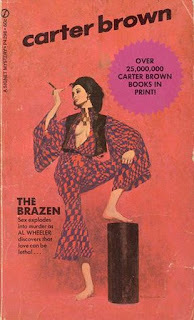 A pulp still worth reading, I suspect. 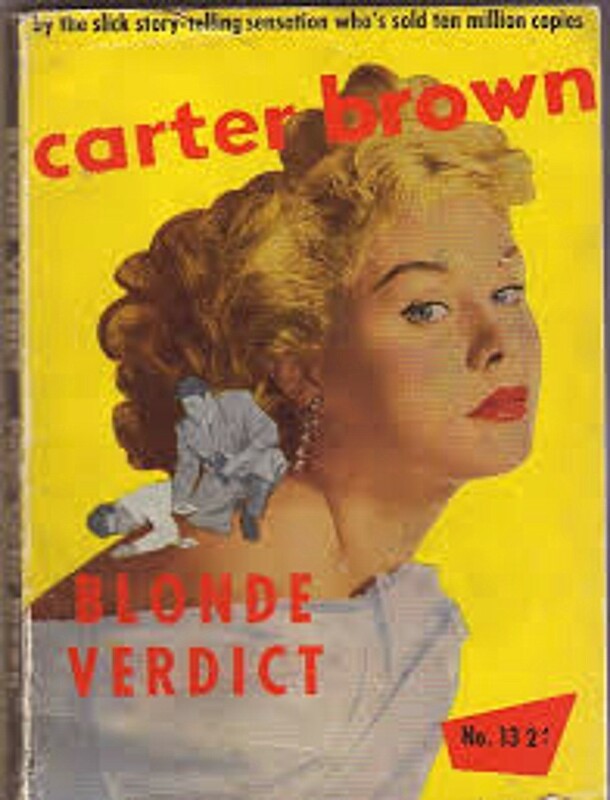 BLONDE VERDICT (the title of the original Australian edition) is the second book in the Lt. Al Wheeler series by Carter Brown, who, as you all know, was really English ex-pat Alan G. Yates. 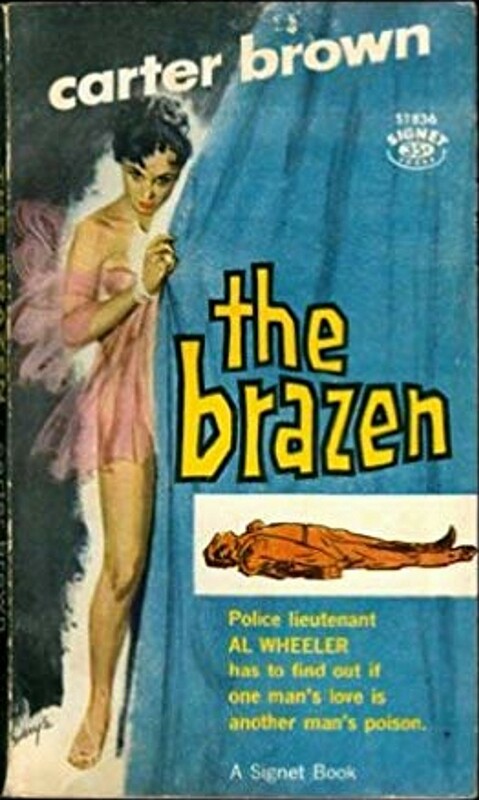 A revised version was published in the U.S. by Signet under the title THE BRAZEN, but the real deal is available in Stark House’s great series of omnibus reprints of the Al Wheeler series, from the start in chronological order. This is still not quite the Al Wheeler those of us who grew up reading the Signet editions know and love, but he’s pretty darned close. Or rather, Al is the same guy, but his supporting cast is slightly different. He works for Captain Parker, and the police commissioner is named Lavers. 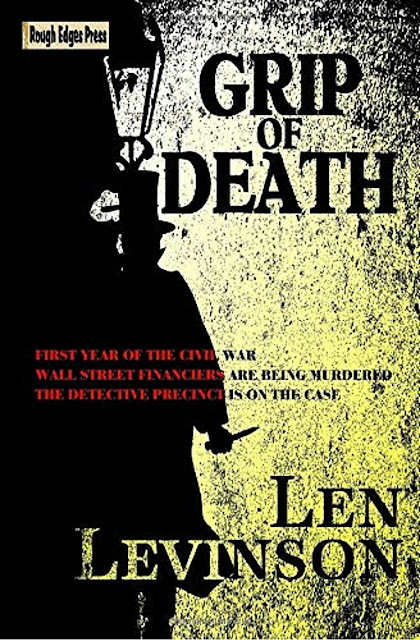 In the Signet editions, Al is a sheriff’s department investigator working for Sheriff Lavers. There’s a Sergeant Mcnamara mentioned, but no Sergeant Polnick. Doesn’t matter. 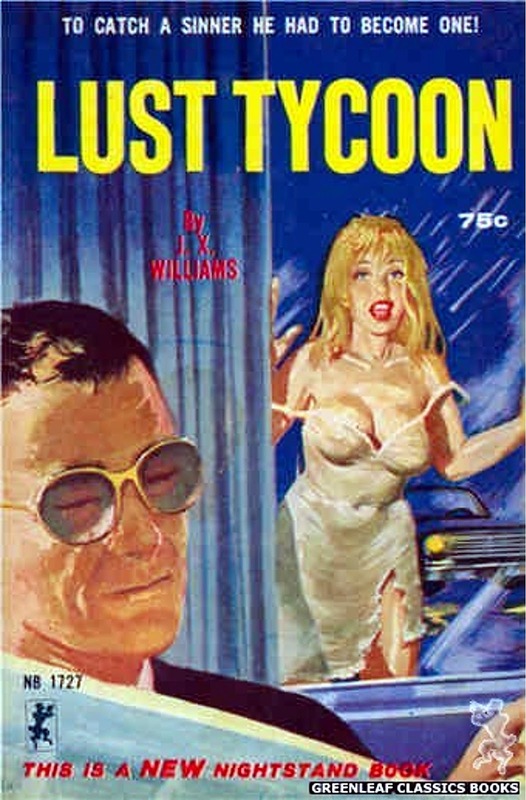 Al is still the same wise-cracking hotshot with an eye for beautiful babes, of whom there are plenty in this book, starting with the blonde Al is with in a nightclub when one of the other patrons drops dead at his feet. Turns out the guy is a lawyer with a beautiful wife who hates him, a beautiful mistress who’s really in love with somebody else, and a partner with a good reason to want him dead. Oh, and there’s the gangster who was being represented by the dead man in a murder trial, and the even bigger gangster that guy works for, and . . . But you get the idea. Lots of suspects for Al to interrogate and cheerfully insult, and plenty of babes to come back to his bachelor pad and listen to his hi-fi with him, as well as giving him an alibi when he’s accused of one of the many murders that take place.